Smooth, powerful, and athletic, the 7-Series is virtually devoid of dynamic flaws. Spacious and exceeding comfortable, it delivers first-cabin travel by any standard. How you cope with iDrive and the other new-think controls depends on how comfortable you are with cutting-edge technology. Be sure to try the system carefully before considering a 7-Series sedan. BMW redesigned its flagship rear-drive sedans for 2002, giving them fresh styling, an innovative control layout, and the industry’s first six-speed automatic transmission. Both the iDrive control setup and the imaginative body profile engendered considerable controversy, prompting love-it-or-hate-it responses from both the media and the public. 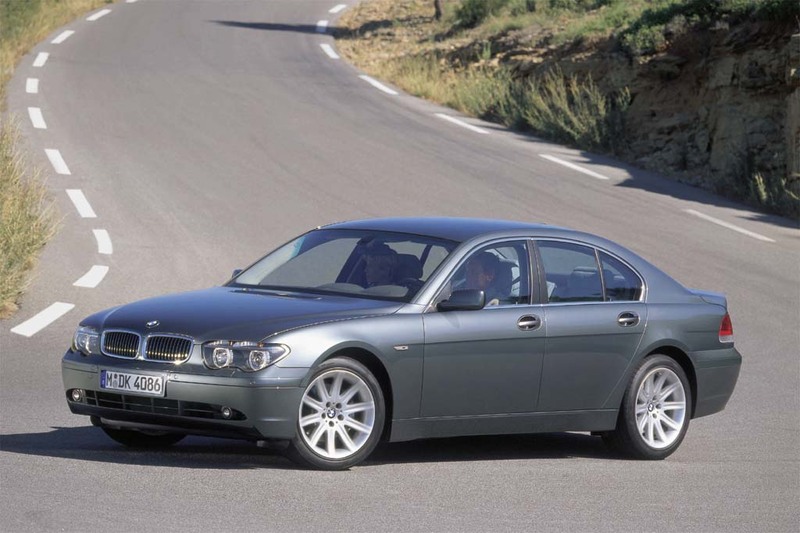 Compared to the old 7-Series, the 2002s were about 2 inches longer in wheelbase, overall length, and height. These luxury four-doors were also 1.6 inches wider and some 120 pounds heavier. A 4.4-liter V8 continued in renamed 745i and long-wheelbase 745Li models, but it was actually a new design with 43 more horsepower than the previous 740i/740iL. The six-speed automatic transmission operated from a stalklike steering-column control instead of a conventional console-mounted lever. BMW’s new Active Roll Stabilization system adjusted front and rear antiroll bars to minimize body lean in turns. An Adaptive Ride Package with electronically adjusted shock absorbers and rear self-leveling, via new air springs, was an Li option. Both models rode standard 18-inch wheels but could have 19s at additional cost. Each had antilock all-disc brakes and a traction control/antiskid system. Inside, front knee airbags joined torso and head-protecting side airbags as standard equipment. Rear torso side airbags also were available, coupled with tubular head-protecting airbags that ran the full car length on each side. Sensors deployed any airbag only if an occupant was detected. Antiwhiplash front head restraints were standard. 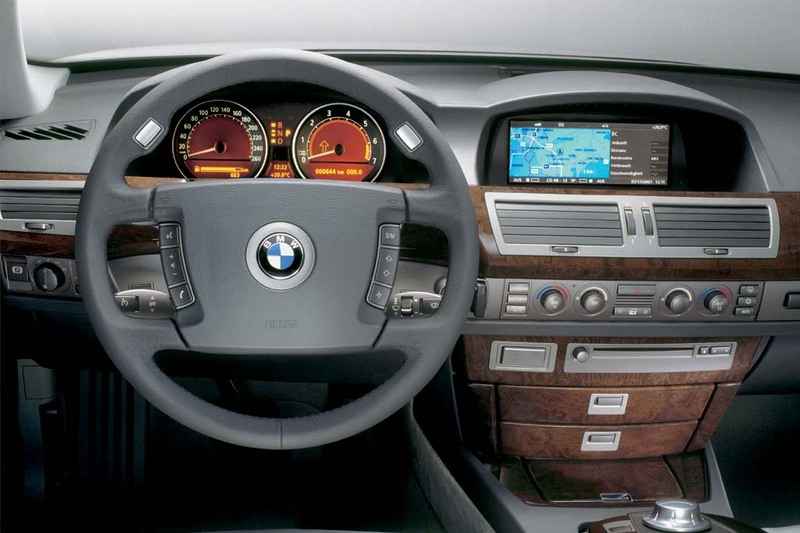 BMW’s iDrive control used a console “joystick” to select and change various audio, climate, and navigation functions, as well as operation of an available phone. The settings displayed on a dashboard screen. Conventional switches were provided for a few frequently-used adjustments of the audio and climate systems. Options included a tire-pressure monitor, front/rear obstacle detection, in-dash CD changer, break-resistant window glass, and power rear sunshades. Power 20-way front seats with internal fan ventilation and a power “massage” feature also were available. A V12 flagship joined BMW’s top-line sedans for 2003. The 7-Series was now offered as the 745i, the 5.5-inch-longer 745Li, and the new 760Li. The 745 models used a V8 engine, but the 760Li got a 6.0-liter V12. 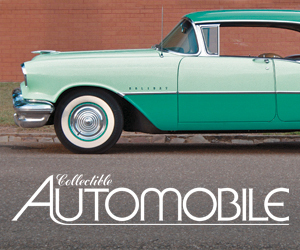 All models came with a six-speed automatic transmission. Inside, full-length head-protecting side airbags moved from the options list to become standard equipment. All models had BMW’s iDrive, with its “joystick” knob to operate audio, navigation, and some phone and climate functions. BMW’s Adaptive Ride Package was standard on the 760Li, optional on others. The 760Li also included front/rear obstacle detection, and ventilated front and rear seats. Rear seats in the 745Li could have internal fan ventilation as an option. New options for 2003 included active cruise control, designed to maintain a preset distance from traffic ahead, as well as 18-inch run-flat tires. Satellite radio was a new option on 2004 models, but little else changed. Rear DVD entertainment and keyless access that allows entry and starting without removing keyfob from pocket or purse are among the new-for-2005 options. Newly standard for ’05 are steering-linked headlights and front and rear obstacle detection. 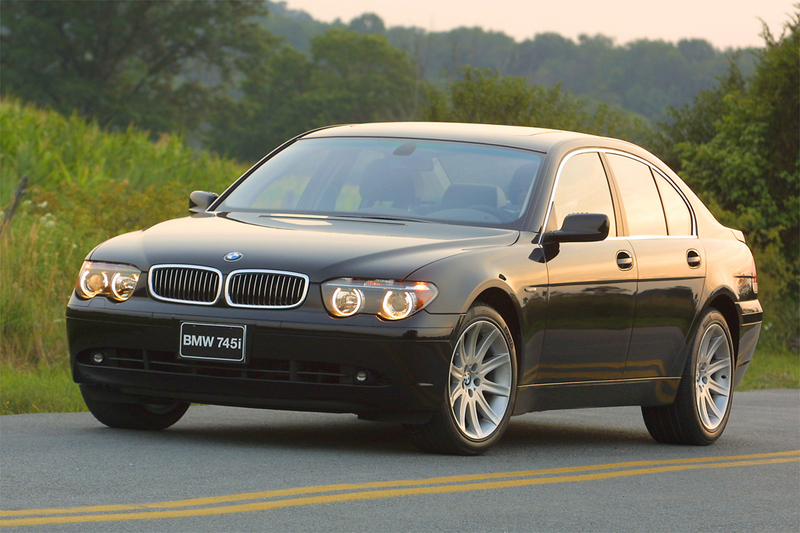 Updated styling and more V8 power highlight BMW’s 2006 flagship sedans. All get revisions to exterior appearance, interior trim, dashboard, and chassis. A 360-hp V8 powers 750i and 750Li models, which replace the 325-hp 745i and 745Li. Also newly revised is BMW’s iDrive, which adjusts audio, navigation, and climate settings via a console “joystick” knob and dashboard screen. Added for ’06 is a wireless cell phone connection. A sport-themed model was a midyear addition to BMW’s large sedan lineup for 2007. The 750 offered an optional Sport Package with firmer suspension and, for ’07, 20-inch wheels. Standard power folding door mirrors were new for ’07, and 750s gained heated 16-way “comfort” front seats. Newly optional were BMW Individual packages with various mixes of trim and features. Also available were DVD entertainment and keyless entry and starting. 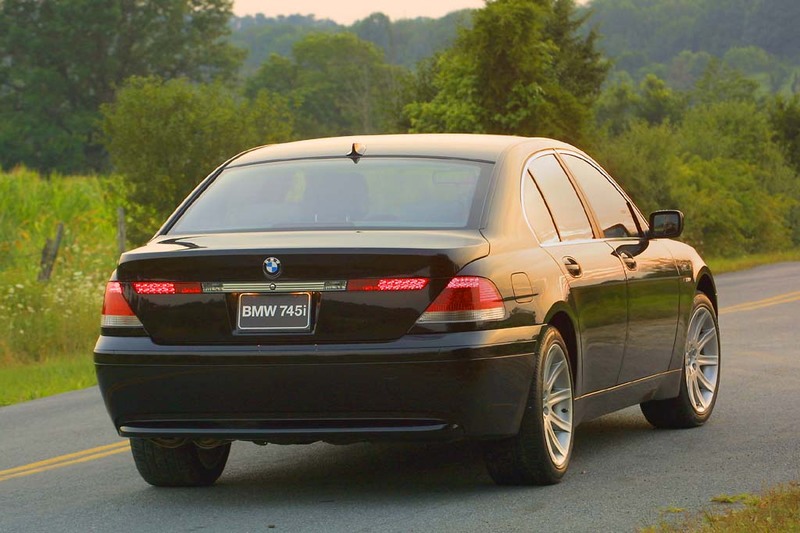 There were no changes of note to the 2008 BMW 7-Series lineup. For its first season, the 7-Series came only with a 4.4-liter V8 engine that made 325 horsepower. A 760Li sedan with a 438-horsepower, 6.0-liter V12 engine joined for 2003. Both engines drive a six-speed automatic transmission. In 2006, a 360-hp V8 powers 750i and 750Li models, which replace the 325-hp 745i and 745Li. Acceleration with the V8 is robust, though traction control intrudes to take some steam out of starting-stopping sprints. Some examples tested when new also suffered stuttering movement from a stop or walking pace. All told, though, you can expect effortless high-speed cruising. BMW quoted 0-60 mph acceleration in 5.9 seconds for the V8 model and 5.4 seconds for the 760Li. Fuel economy is about as expected. A test 745i averaged 17.0 mpg, helped by a long highway trip. Premium fuel is required. Any 7-Series is a model of smooth discipline on the road, less-isolated than a Lexus LS 430 or Mercedes-Benz S-Class on flawed pavement, but never uncomfortable. Low-profile 19-inch tires slap into sharp bumps, but detract only slightly. 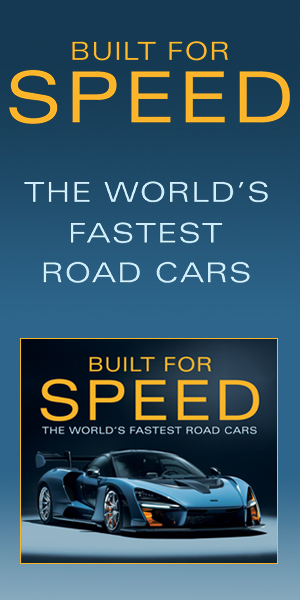 Steering/handling ranks as the sportiest among premium luxury sedans. A 7-Series is never ponderous, and Active Roll Stabilization uncannily quells most body lean. With 19-inch tires, steering feels even more alert, turn-in crisper, and grip tenacious. Wind is a mere murmur on the highway. The V8 engine hits a rich, strident note at full throttle, but is hardly noticed otherwise. Instruments/controls are another story. The unfamiliar design of important controls compels reorientation to a different world of driving. The gearshift, for example, is a small electric flipper, with spring-back movements and push-pull activation that’s not self-evident. Anything more than the simplest climate and audio adjustments forces interaction with iDrive. Accessing a daunting range of communication, navigation, and entertainment tools; it even adjusts suspension firmness and deactivates the antiskid control. Sadly, learning its ways and coordinating its joystick movement while driving takes hours of practice and diverts attention from the road. Controls are easy to reach, at least, though the iDrive screen can wash out in sunlight, and the power-seat cluster is awkwardly mounted on the console sidewall. 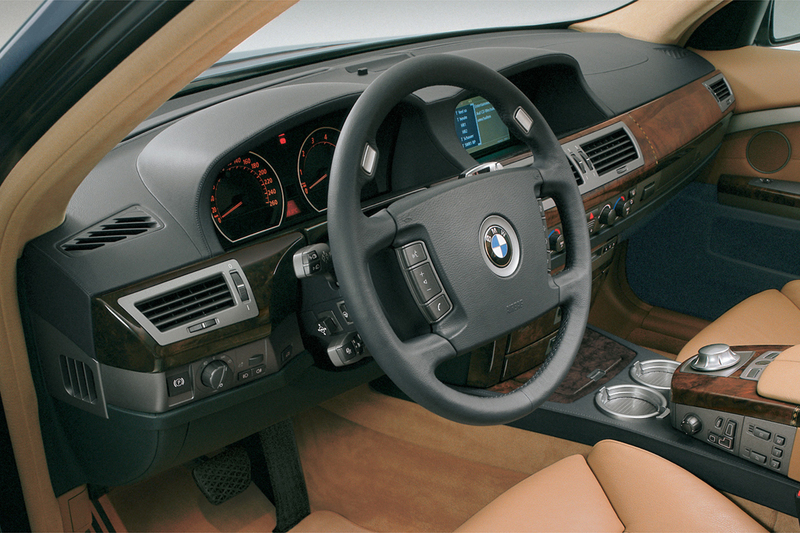 Quality materials and generous use of wood gives each 7-Series interior a sophisticated, modern-furniture ambience. Firm, roomy front seats promise fine contour and support, though tall drivers may wish for more seat travel. And only V8 models with a “Comfort” or “Luxury” seat option have independent adjustment of side bolsters and headrest height. Front headrests block some over-the-shoulder vision. Stepping into the rear means entering the lap of luxury, especially for two adults. Back doors could open wider for easier foot clearance, though. Four golf bags fit transversely into the large, luxuriously finished trunk. The optional power lid (if installed) opens and closes with the push of a button. Cabin storage is good. Description: The fuel pump control system may have been programmed wrong, causing it to run at the wrong speed, leading to possible engine stall. Dealers will inspect and replace affected parts. Description: Due to a software error, the engine may stall and drivers may not be able to restart it. Dealers will inspect and replace affected parts. Description: A check valve of the brake vacuum pump may leak a small amount of lubricating oil. Over time this could result in contamination of the brake booster. Power assist braking performance could be adversely affected. In extreme cases there could be a complete loss of power assist braking. An unexpected reduction or loss in power braking assist may increase the risk of a crash. Description: An oil leak may occur due to a faulty oil filter drain plug. Dealers will inspect and replace affected parts. Description: Heating mat in backrest’s side bolster of cars with front-seat heating could be damaged by excessive contact when entering/exiting the vehicle; overheating could melt a small hole in the seat cover and possibly burn the occupant. Description: On 8 and 12 cylinder vehicles, engine stalling and a loss of power steering might occur because of faulty digital engine management control units. Dealers will inspect and replace affected parts. Description: The driver’s seat occupant detection system may be unreliable, and cause the airbags to remain inactive during a crash due to incorrect programming. Dealers will reprogram the software. Description: On certain cars, engine stalling may occur after short period of operation; engine may be unable to restart. Description: In certain crash conditions, driver’s frontal airbag, knee airbag, head protection system, and safety belt pretensioner may not deploy. Description: Incorrectly-manufactured parking pawl guide plate could cause parking lock system not to engage, after transmission is placed in “Park” position. Description: Vehicles with Comfort Access and soft-close automatic doors may appear to have doors closed and latched but may open while vehicle is underway. Description: Vehicles with Comfort Access and electronic key may inadvertently shift into neutral instead of park but still allow the driver to remove the key. The vehicle could roll away. Heated front and rear seats, 16-way front ventilated and massaging comfort seats w/multiple backrest adjustments, front passenger-seat memory, front active head restraints. NA w/Cold Weather Pkg. Electronic shock-absorber control, self-leveling rear suspension. Automatic soft-close doors, power trunk opening and closing. Heated front and rear seats, heated steering wheel, ski bag. In-dash 6-disc CD changer, upgraded sound system. 16-way front ventilated comfort seats w/multiple backrest adjustments, front passenger-seat memory, active head restraints. Std. 745Li. Requires Luxury Seating Pkg. or front comfort seats. Includes side window sun shades. Includes 245/45R19 front tires, 275/40R19 rear tires. Price Note: 760Li adds $1700 Gas-Guzzler Tax. Heated front and rear seats, 16-way front ventilated and massaging comfort seats w/multiple backrest adjustments, front-seat active head restraints (745i). NA w/Cold Weather Pkg. Sport steering wheel and seats, unique exterior trim, sport suspension, 245/45R19 front tires, 275/45R19 rear tires, special alloy wheels. NA w/Adaptive Ride Pkg., Luxury Seating Pkg., Cold Weather Pkg. Heated front and rear seats, heated steering wheel, trunk pass-through w/ski sack. Includes rear cool box. Deletes trunk pass-through w/ski sack. Includes 245/45YR19 front tires, 275/40YR19 rear tires. Sport seats and steering wheel, Shadowline exterior trim, color-keyed roof-rail trim (745Li), sport suspension, 245/45YR19 front and 275/40YR19 rear performance tires, unique alloy wheels. 16-way ventilated comfort front seats w/multiple backrest adjustments, front passenger-seat memory, active head restraints. Price Note: 760i, 760Li add $1300 Gas-Guzzler Tax. Sport seats and steering wheel, special wood interior trim, Shadowline exterior trim, color-keyed roof-rail trim (745Li), sport suspension, 245/45WR19 front and 275/40WR19 rear performance tires, unique alloy wheels. Heated front and rear seats, 16-way front ventilated and massaging comfort seats w/multiple backrest adjustments, passenger-seat memory (745i). NA w/Cold Weather Pkg. Heated front and rear seats, heated steering wheel, ski sack. Includes armrest cool box. Deletes ski sack. 16-way ventilated comfort front seats w/multiple backrest adjustments, front passenger-seat memory. 745i, 745Li require heated front seats. Price Note: 760i, 760Li add $1700 Gas-Guzzler Tax. Sport seats and steering wheel, special wood interior trim, Shadowline exterior trim, color-keyed roof-rail trim (750Li), sport suspension, 245/45WR19 front and 275/40WR19 rear performance tires, unique alloy wheels. Heated front and rear seats, front ventilated comfort seats w/multiple backrest adjustments, passenger-seat memory (750i). NA w/Cold Weather Pkg. Electronic shock absorber control, load-leveling rear suspension. Automatic soft-close doors, power trunklid opening and closing. In-dash 6-disc CD/MP3 changer, upgraded sound system. 750i, 750Li require heated front seats or Luxury Seating Pkg. Price Note: Alpina B7 adds $1300 Gas-Guzzler Tax. 760Li adds $1700 Gas-Guzzler Tax. Sport steering wheel, special wood interior trim, Shadowline exterior trim, sport suspension, 245/40R20 front and 275/35R20 rear performance tires, unique alloy wheels. Heated rear seats, front ventilated seats, active and massaging driver seat, heated steering wheel, power rear sunshade and manual side sunshades, ski sack. NA w/Cold Weather Pkg. Electronic shock absorber control, load-leveling suspension. Heated rear seats, heated steering wheel, ski sack. Full leather upholstery, alcantara headliner, illuminated door sills, unique interior trim, 20-inch alloy wheels. NA w/Sport Pkg.